We are the exclusive Australian retailer for new sales of world renowned forklift brands - Toyota Industrial Equipment, BT Lift Trucks and Raymond Forklifts - allowing for a combination of counterbalance, electric powered pallet trucks, stackers, order pickers and narrow aisle equipment that is second to none. Within Australia, over 50,000 Toyota forklifts have been sold, and the brand has been the Australian counter-balance forklift market leader since 1987. 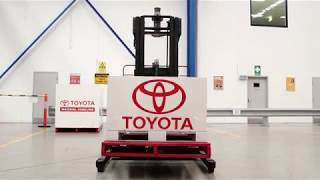 Toyota's selection of internal combustion and battery-electric counterbalance forklifts range from 0.9 tonnes right up to a massive 24.0 tonnes. Toyota, BT Lift Trucks and Raymond Forklifts are global leaders in the field of warehouse equipment, with a range of products committed to increasing your productivity and reducing your materials handling costs. In addition to our range of forklifts and warehouse equipment, Toyota Material Handling Australia also distributes the Toyota range of Huski skid steer loaders and tow tractors for sale and purchase, commonly used for earthmoving and cargo-handling purposes respectively, as well as Bravi elevated work platforms, Huski scissor lifts, Fiorentini sweepers and scrubbers, pallet racking and warehouse racking solutions. Toyota Material Handling's commitment to customer satisfaction extends nationwide, thanks to one of the finest branch networks in Australia. There are major Toyota Material Handling (TMH) outlets for forklift sales and rentals located throughout every state of Australia. Our branches also offer the flexibility of Fleet Management options, allowing your forklift fleet to change to match your needs. And not only can we facilitate the sale and rental of new Toyota, BT and Raymond forklifts, we can also assist when designing your new warehouse. Our team of material handling solution experts can assist in identifying the optimum warehouse layout to maximise efficiency and forklift productivity. Toyota Material Handling's branch network is here for you! Toyota Material Handling can help provide solutions to your material handling requirements with a free, no obligation inspection at your premises. Call us today on 1800 425 438 to arrange your free site inspection and material handling equipment review. For over 50 years Toyota has been at the forefront of the global materials handling market. The world's largest forklift supplier*, Toyota Material Handling has been a pioneer in forklift technology and a world leader in making forklifts more productive, safer and cost-effective. Toyota's range of forklift products are developed by personnel who can utilise the advantages of Toyota's advanced manufacturing technologies, and built to the same exceptional standards of quality and reliability as the company's automotive products. These two components are the key to Toyota Material Handling's success, and a major reason why so many customers continue to buy Toyota Material Handling forklift and skid steer loader products time and time again.